"Humidity" refers to the presence of water vapor in the atmosphere. It is measured in either relative terms (relative humidity) or absolute terms (dewpoint temperature). Water vapor is, as the name implies, the vapor form of water. It is totally transparent, just like the rest of the gases in the atmosphere. So, we really can't see humidity with our eyes...only the effects of water vapor condensing back into water droplets (such as in the photo above). Relative humidity is a measure of how close to saturation the air is with water vapor. At any given temperature and pressure, air can "hold" only so much water vapor before the vapor begins to form liquid water drops, such as fog or clouds. At 100% relative humidity, the air is saturated. A relative humidity of 0% would indicate that no water vapor is present. Dewpoint temperature is an absolute measure of how much water vapor is in the air. The warmer the air, the greater the amount of water vapor it can contain. So, for example, if air at a temperature of 100 deg. F had a dewpoint of 80 deg. 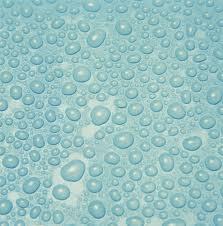 F, this would be a very large amount of water vapor in absolute terms, but the relative humidity would only be about 53%, indicating the air could hold almost 2 times more vapor before becoming saturated. At a very cold temperature of, say, 0 deg. F, if the dewpoint is also 0 deg. F, then the relative humidity is 100% (the air cannot hold any more vapor without liquid droplets or ice crystals forming), but the absolute humidity is very low, that is, there is very little water vapor in the air in absolute terms. A nice little conversion tool between temperature, dewpoint, and relative humidity can be found here. EFFECTS OF HUMIDITY ON THE HUMAN BODY When the dewpoint is high, it feels "hotter" because your skin is not able to cool as efficiently as when the dewpoint is lower. You continuously lose moisture from your skin (even when not visibly sweating), which removes heat from your body which is required to change water from its liquid state to vapor state. This loss of moisture is directly proportional to how little water vapor is in the air in absolute terms. This is why desert areas, even with temperatures 20 deg. F warmer than humid areas, can feel cooler to you. The warming effect of higher air temperature of deserts is more than offset by your body being evaporatively cooled as your skin loses water faster.